This is nice map that consists of two team lands that are connected by shallows. The shallows typically form in one or two places, create one or two shallows bridges between team islands. Surrounding the players is a river with plenty of fish. This is a different approach to the Danube maps found here also. These have been tested with the AOE HD version and work well. This is a unique map in that 2 bridges appear when there are 3 or more players per team. In all other instances there is usually only one shallows bridge. 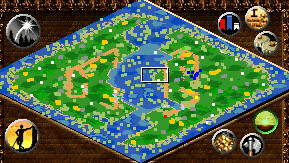 I think it is well balanced for ROM games and ads diversity to the standard strategy because of the bridges and the plentiful amount of fish and land food. It is a unique theme that feels like a city on a river. There are different terrains for the same map. Everything looks layered and mixed including the grass, trees and water areas. Looks nice on the mini map and suits the theme very well. Plays like a normal Random Map game. It has high land and water resources. But players may get confused as to whether they use land or navy. I found that if the bridges are held off with walls then naval battles are essential. If the shallows that join the team lands are open then it is better to focus on standard land based strategy. The only reason I reduced playability is because of the confusion over land or navy otherwise it would deserve a 5. I liked the map but think the players on the ends can be a bit too close to their opponents in a 4v4 game. In all other instances it seems fine.